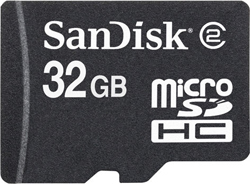 SanDisk has announced the first ever 32 Gigabyte MicroSDHC Memory Card. This is good news for mobile phone owners that use MicroSDHC memory cards as it easy to fill up smaller memory cards. In addition the camera sensor on mobile phones are getting more megapixels which means that the picture files get bigger and bigger. The SanDisk 32 Gigabyte MicroSDHC Card will be available in March 2010 and cost around $200. Milpitas, Calif., March 22, 2010 – SanDisk Corporation (NASDAQ: SNDK), the global leader in flash memory cards, today announced that it will begin shipping the world’s highest-capacity removable memory card for mobile phones – the 32 gigabyte (GB)1SanDisk microSDHC™ card. The new microSDHC card offers consumers an unprecedented level of freedom and flexibility in how they store, send and enjoy digital content. Smartphones have evolved far beyond the simple phone call. They serve as mobile offices, music players, movie theaters, cameras, video recorders, GPS devices and gateways to the mobile Internet. The highly-versatile 32GB SanDisk microSDHC card delivers immediate memory expansion that lets consumers enjoy the storage-intensive features of their advanced handsets. For example, the 32GB SanDisk microSDHC card can store enough music to outlast 35 round-trip flights between San Francisco and New York before repeating a single song. The 32GB SanDisk microSDHC card is available starting Tuesday, 3/23/10 on SanDisk.com U.S. and European e-commerce sites, with worldwide retail availability to follow next month. The new card comes with a 5 year limited warranty and carries a suggested retail price of $199.99. The 32GB SanDisk microSDHC card also lets mobile network operators (MNO) and handset manufacturers (OEMs) equip their subscribers with enough storage to match the industry’s leading smartphones. By bundling SanDisk’s new card with the phone, consumers get high-capacity mobile storage in a convenient form factor. SanDisk microSDHC cards are also available in 2, 4, 8 and 16GB capacities and are shipping today in volume. SanDisk is mass producing the new cards based on its industry-leading, third-generation 32nm X3 (3-bit-per-cell) technology, which makes a 32GB capacity possible in such a small form factor. The successful development and wide distribution of many X3-based products through OEM and retail channels in recent years demonstrates both the technology’s maturity and SanDisk’s ability to quickly bring it to market. SanDisk microSDHC cards adhere to the stringent quality expectations of top-tier handset manufacturers and MNOs, and SanDisk is taking orders now. To meet the specific needs of different OEM customers, the 32GB SanDisk microSDHC card is available in a variety of card and adapter configurations as well as with the option to pre-load the card with custom software. SanDisk Corporation is the global leader in flash memory cards, from research, manufacturing and product design to consumer branding and retail distribution. SanDisk’s product portfolio includes flash memory cards for mobile phones, digital cameras and camcorders; digital audio/video players; USB flash drives for consumers and the enterprise; embedded memory for mobile devices; and solid state drives for computers.SanDisk is a Silicon Valley-based S&P 500 company, with more than half its sales outside the United States.